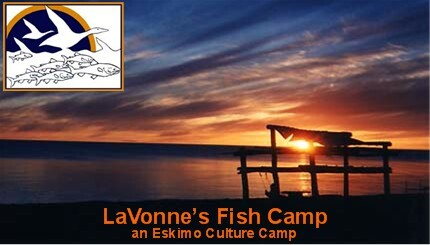 Visiting LaVonne's Fish Camp is a real Alaskan adventure! We're a unique culture camp deep in Inupiat Eskimo country operated by Arctic Circle Educational Adventures (ACEA). It's located five miles south of Kotzebue, Alaska and about 30 miles north of the Arctic Circle in Northwest Region of Alaska. LaVonne's Fish Camp is a small, intimate, modest fish camp with a million-dollar view. Traditional subsistence salmon drying racks share the beach with a “smoker,” fish processing sheds, crew quarters, and a salmon net. Immediately in front is a continuous gravel beach that runs around the entire Baldwin Peninsula and the shallow Chukchi Sea. The sea runs 162 unobstructed miles to Eastern Siberia. Behind the camp is a 250-foot clay bluff, a slim ribbon that connects the beach and the open tundra that seems to go forever with a 360-degree view. There are no neighbors nearby, though local folks stop often for coffee and to chat on their way to hunt, fish, pick berries and “greens.” Others come to help prepare fish for subsistence use. Twenty-four hours of daylight allow ample time for visiting with local people, hiking on the tundra, birding and beachcombing.